Warning – if you read the trades and are not up to date with The Walking Dead (ie up to #48), then it is probably an idea to stop reading this post now. As we return to the scene of the massacre, a familiar face surveys the battleground, clearing up one plot thread while taking care of some business, as old friends threaten to reanimate. Meanwhile Rick & Carl are trying to come to terms with the horror of their loss, while having to cope with the new hostile environment they are in. They are out in the open, vulnerable physically as well as mentally, having to look for food and shelter, dealing with undead ‘roamers’. Rick in particular is ailing now, still sick from the gunshot wound, and his injuries and disabilities are beginning to count against him. The father as protector is not a certainty in this scenario. Carl needs to be able to handle deadly situationa, and does. Despite these moments of grim survival, Kirkman does manage to extract humour from the routine of scavenging. Carl, despite his experiences, shows a child’s petulance when faced with ‘crappy cereal’ as they go through the remains of a convenience store. Apart from the initial pages of this issue, the focus is solely on Rick & Carl. The last few pages are about detailing the new minutiae of their existence, and not a lot happens, but the small touches, such as Carl’s all too obvious grief, are touching and are made so by Adlards sterling artwork. The final scenes are low key compared to recent issues, but no less devastating a cliffhanger awaits. Maybe Kirkman is not going to back away from killing off more major characters. No-one is still safe, even though that arc ended. You know he can and will do it. There are never enough pages in these damn issues. 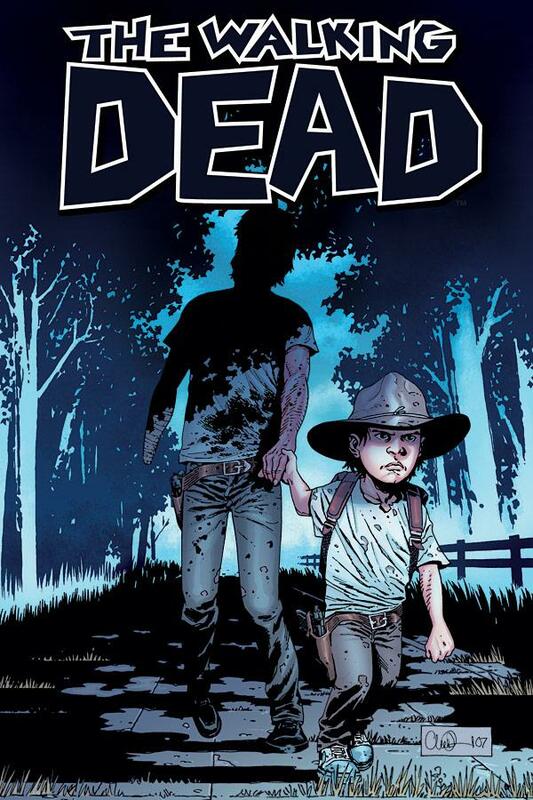 Next up, the big 50, with the tagline, ‘All Alone Now’………you get the feeling that Kirkman is about to heap more misery on whats left of the Grimes family.